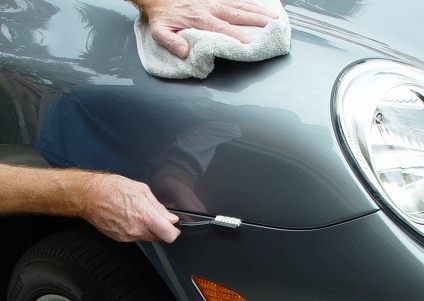 Do We Treat Our Cars Better Than We Treat Ourselves? Running Saturday morning errands, you may have found yourself in traffic, only to realize you’re stuck behind a line of vehicles inching into a car wash. Each month, nearly half of all American car owners head into one of the nation’s estimated 100,000 car washes to bathe their vehicles in some loving suds. “Then there are those—and I love these people—” says Mark Curtis, CEO of the Splash Car Wash chain, who visit weekly, core customers “who truly care for their cars” and “see them and their upkeep as a reflection of themselves, and have it as part of their regular routine.” This ardent minority keeps alive the cliché that we Americans love our cars, an oversimplification that fails to capture our divergent, ambivalent, evolving feelings about them. Still, on the whole, we may treat our vehicles better than we treat ourselves. Take a gander at how much cash and credit we lavish on them. On the household level, transportation accounts for one out of every six dollars Americans spend, the crushing majority of which goes to owning and operating cars. (By contrast, families who use public transportation and own one less car can save up to $8,400 a year, according to APTA). Only housing accounts for a bigger chunk of our budgets; we fork out less for food. 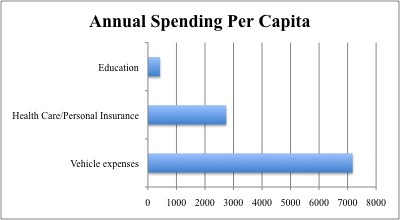 It’s especially illuminating to look at spending “per capita”—that is, how much we spend per person and per vehicle in our household. Though we spend more than twice as much to fuel each body in our home with food than we do to fuel each vehicle in our garage with gasoline, there are several measures by which we treat our cars nearly as well or better than we treat ourselves—and our families. The average American spends nearly as many dollars annually on the health and well-being of each vehicle—$2,536 for repairs, maintenance, and insurance—as we spend on each humanoid member of the family, whose allocation for healthcare and insurance is $2,747. That’s just $18 more a month preventing and treating disease than repairing dings and replacing tires. The amount we dedicate to buying and financing each car is triple what we spend educating each family member. In other words, we pour three times as much into our depreciating assets than we invest in our own, and our children’s, futures. And while it is reassuring that we devote more of our household budget to shelter than we do to our vehicles, even a hunk of our housing costs are used to protect and pamper our cars rather than ourselves. Real estate experts have estimated that 13 percent of a home’s value is accounted for by its garage. For the average family, that means that each year about $1,150 of mortgage payments, never mind some property taxes, are going to keeping a roof, not over our children, but over our vehicles. Without that hidden expense, we’d be able to put two-thirds more toward charity or clothing our growing kids. Then there’s the quality time we devote to them—and even if time isn’t money, it’s still, well, time. 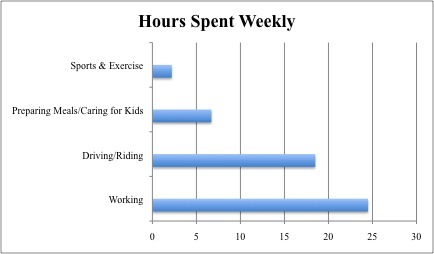 According to Arbitron, the average American adult spends 18.5 hours per week on the road, much of this driving solo, compared to the 6.7 hours per week spent preparing meals and caring for children and only 2.2 hours per week exercising to stay healthy and happy. While driving equals leisure for a few avid enthusiasts, most experience commuting as more stressful than pleasurable. In our sprawling communities, we find that we must drive—or are in the mindless habit of driving—to pursue our social lives or interests. The hope that moving to the suburbs or exurbs will mean more family time has been, for many, a pipe dream. Americans have been driving fewer miles recently–billions fewer–saving on gas money and other direct costs of car ownership. That’s good news. This reduction doesn’t just save those families money; it saves all of us from incurring the innumerable indirect costs of driving. Further reductions in the time and money we all devote to the national automobile fleet are possible if we recognize that we are treating our cars better than we treat ourselves—and, better yet, if we ask why. Great article. I’ve been saying this for ages. It’s the classic sign of an addiction. Just like a crack addict who will do anything and give up anything for their fix, so will car owners. We have a real serious problem with cars in this country, and we needs more article like this to get be spread around so people start looking in the mirror and considering what is really important. By the way, we are also more afraid of sweat than fat, which is why it cracks me up when I hear people who complain about cycling because they get a little sweaty while they are overweight and struggling to get to the gym regularly. But again, when you’re addict, you can’t think straight. It’s funny to read this, because my last landlord would see me cleaning and oiling my bicycle, and he would mention that I seemed to take better care of my bike than my car. To which I say, “well, of course, I use my bike every day and my car every two weeks or so.” He just thought it was very strange. I think it’s strange that he drives in Cambridge, MA. I would go nuts if I had to drive in that city every day. yeah i look at all the fat ugly slobs caring waaay to much about their material stuff and i think….when you have a heart attack, does that material matter? must have everything perfect….clean….exact…shiny…yet i havent seen my feet in years….and im out of breath going up 10 steps…cracks me up. i know several people like that..always buying the newest tvs and computers…washing their cars 3x a week and perfecting how clean their dish washer is…funny…and simply…these people are fat and nasty…must be a mental disorder. Self-service car washes litter my neighborhood. Along with gas stations and drive thru’s, I wish they were zoned out of existence to make my street more livable. Interesting post. Another thought: how much energy and water does it take to wash a car in acar wash?What’s the annual national cost? In many households, a considerable part of the driving is devoted to carting the children to various activities. Consider the stereotypical “soccer mom” and her minivan with a “Mom’s Taxi” bumper sticker. on the one hand, we have this post that says people spend more time and money on their cars than on their kids. on the other, we keep hearing that we’re raising the most pampered, spoiled and overindulged generation ever. both can’t be right. How we treat the car as we treat Ourselves. if we take care our car then it will also run as we want to run. I haven’t owned a motor vehicle for over five years. I bicycle, walk and take public transportation. Way to over generalize everyone with your blanket statement. Sounds to me like a jealousy issue. I clean my car and guitars very often. I value my materials but im not a fat slob. get out more and stop blindly generalizing. You’re an idiot. Cars need to be treated better than people.